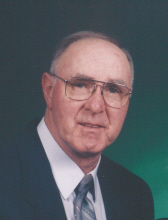 Cherryville - Mr. Henry Eugene "Gene" Davidson, 82, of 201 Kenwood Ave, formerly of Requa Road, passed away on Thursday, November 1, 2018 at Peak Resources in Cherryville. Gene was born in Cleveland County, NC on April 18, 1936 a son of the late Willard Woodrow Davidson and Mary Elizabeth Melton Davidson. He was retired as a long line driver from Carolina Freight Carriers Corporation after 34 years of service. Gene was a member of St. Paul's United Methodist Church where he was served as a former choir member, church treasurer for 25 years and a member of the Methodist Men. He was also a member of Cherryville Masonic Lodge #505 A.F. & A.M., Charlotte Scottish Rite, Oasis Shriners, Cherryville Shrine Club and Roberts Senior Tour Golf Club in Cherryville. In addition to his parents he was preceded in death by his wife of 53 years, Carolyn Fortenberry Davidson; a sister, Sybil Ledford and three brothers, Harley, Harold and Larry Davidson. Survivors include a son, Dale Eugene Davidson; a daughter, Mary Beth Davidson both of Cherryville; a granddaughter, Lauren Myla Davidson and a great grandson, Jaxon Gene Keever and two brothers, Charles Davidson of Shelby and Carroll Davidson of Conover. Visitation will be on Sunday, November 4, 2018 from 1:45 to 2:45PM at St. Paul's United Methodist Church. Funeral Services will be held at 3:00PM on Sunday, November 4, 2018 at St. Paul's United Methodist Church with Pastor Randi Godfrey officiating. Burial will be in the church cemetery with Masonic Rites. Memorials may be made to St. Paul United Methodist Church, Cemetery Fund, c/o Edwin Dalton, 2522 New Prospect Church Road, Shelby, NC 28150. Stamey-Cherryville Funeral Home & Cremation Service is serving the family of Mr. Davidson. To plant a tree in memory of Henry Eugene Davidson, please visit our Tribute Store. "Email Address" would like to share the life celebration of Henry Eugene Davidson. Click on the "link" to go to share a favorite memory or leave a condolence message for the family.